Learning from bitter lessons from last year’s forest inferno where a young forest guard was charred to death in Bandipur, the Forest Department this time has strengthened its fire-fighting capabilities to combat forest fires that tend to ravage large swathes of forest during summer. This Weekend Star Supplement lists out, along with photographs, the innovative measures that the department has taken to prevent major conflagrations. A tragedy struck Bandipur Tiger Reserve on February 18, 2017 when 28-year-old Forest Guard Murigeppa Tammangol alias Murugesh was charred to death while he, along with other forest staff and officials, was trying to douse the forest fire at Kalkare Range. He was stomping out the fire moving fast amidst thick lantana bushes and was unaware that thick smoke was covering him. He collapsed due to suffocation and died of burn injuries. A young life was snuffed out. Fifteen days to go for Murigeppa’s first death anniversary and the Forest Department that has learnt bitter lessons out of the tragedy is trying its best to prevent such unfortunate incidents this time and it is battle-ready to face another summer and its daunting challenges. Fire lines are being set up to control any accidental forest fire in the reserved area. Forest fires in several parts of the National Park last year and in 2012 had caused large-scale destruction of flora and fauna. Fire lines covering all 13 ranges of the reserve have been completed, covering 2,511 kilometres. 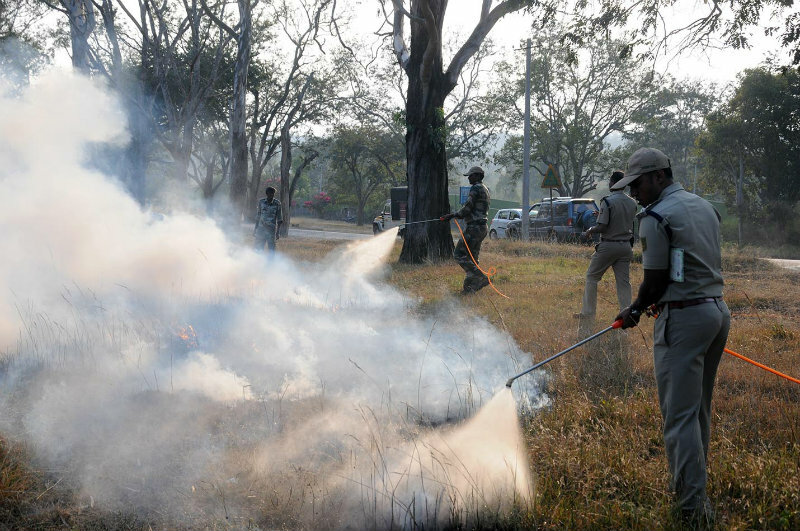 Shoring up its fire-fighting capabilities, forest authorities have equipped themselves with motorised fire sprayers. Also, mini-vans of 2,000-litre capacity have been procured to contain the fire before it turns into a major conflagration. Fire being extinguished using a 20-litre motorised portable can. 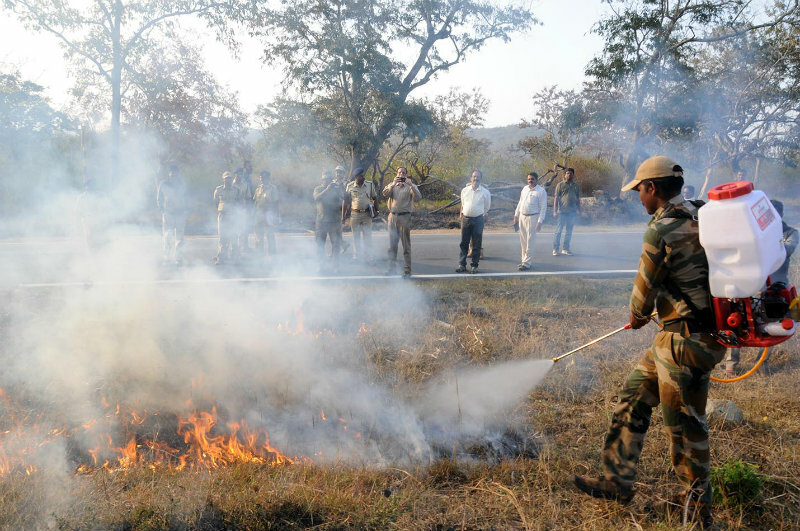 Of the 1,027 square kilometres of Bandipur Tiger Reserve, 2,511 kilometres of fire lines have been completed and each fire line is 10 metres wide. This apart, 108 kilometres and 30 metre-wide view lines have been set up. Fire line is a strip of land that has been cleared of vegetation (mainly dry) to prevent fire from spreading. It is also called fireguard. 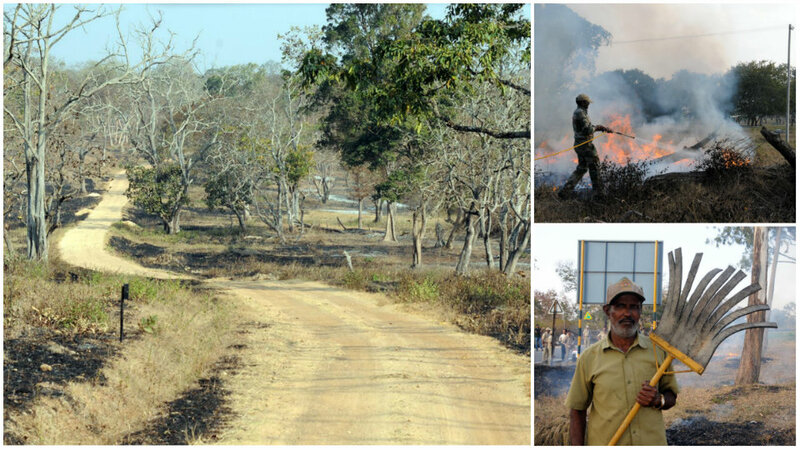 Speaking to Star of Mysore, Conservator of Forests and Director of Bandipur Tiger Reserve Ambadi Madhav said that this time, over 210 kilometres of lantana has been removed and additional fire line of 209 kilometres have been laid as additional precaution. Sensitive blocks have been identified and extra weed have been removed. The department has hired 408 fire watchers from January 1, 2018 and they will be on duty till March 31. “They are additional staff who have been recruited on a temporary basis to act as fire watchers and will be on duty till the onset of the southwest monsoon by when the threat of fires will have completely diminished. This is a normal practice and youth from different tribal hamlets are identified and hand-picked for the job. They receive ration and an extra payment of Rs. 65 per day (for rations) apart from their daily wages of Rs. 308 per day,” said Ambadi Madhav. This time, the department has procured fire beaters from Kerala that is used effectively in the neighbouring State to combat forest inferno. Each fire beater is 6-feet long and has a flat rubber material at the other end made of vehicle tyres. “Usually, we use sticks with green leaves at the far end to beat fire. This time, we are using these fire beaters that are very effective. Fire is doused with just one hit from the beater and the rubber too doesn’t catch fire easily unlike green leaves,” he explained. Each fire beater weighs 7 to 8 kilograms and each costs Rs. 500 and over 275 have been procured from Kerala Agro Industry and they are successfully being used in Kerala to battle forest fires. Forest personnel are seen using advanced equipment to extinguish fire. 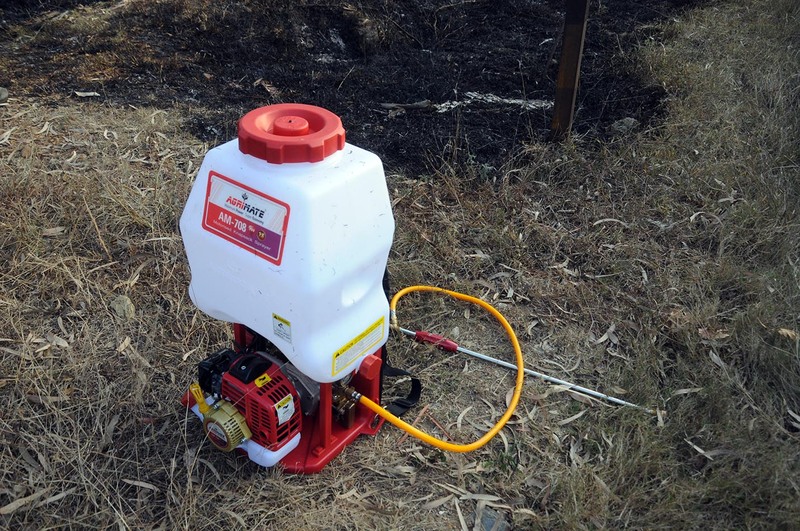 Instead of the traditional leaf fire beaters, the department has procured powerful water pumps fitted to mobile water cans to douse forest fires. This apart, mini-motorised water sprayers of 20-litre capacity have also been provided to all ranges so that the staff can carry the same as backpacks and get into the interiors to put out small fires before they become major infernos. Over 24 cans, each costing Rs. 4,800 have been procured this time. “Water sprayed from these cans can reach up to 15 feet and can be adjusted to spray water in a straight line or for a wide spray. With less water, this can is capable to extinguish spreading fires,” he added. 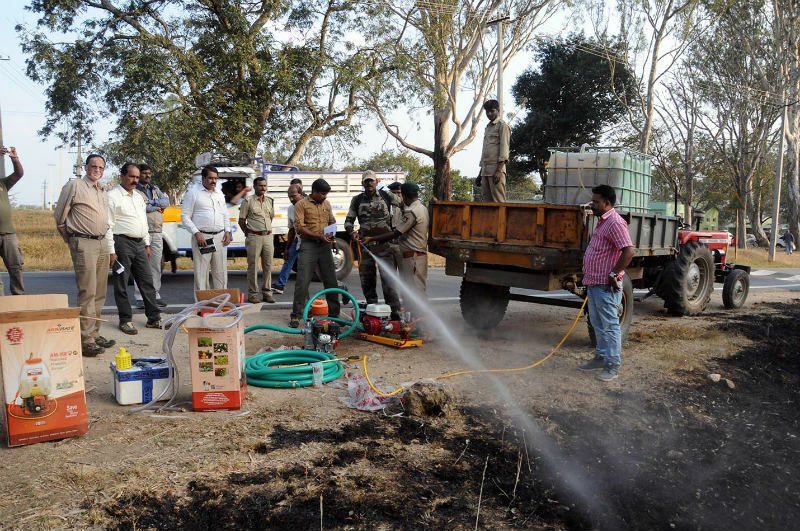 In addition to conventional methods of fire-fighting, such as creating fire breaks and putting out mini-fires by repeatedly stomping, the authorities have deployed water containers of 2,000-litre capacity mounted on special vehicles. 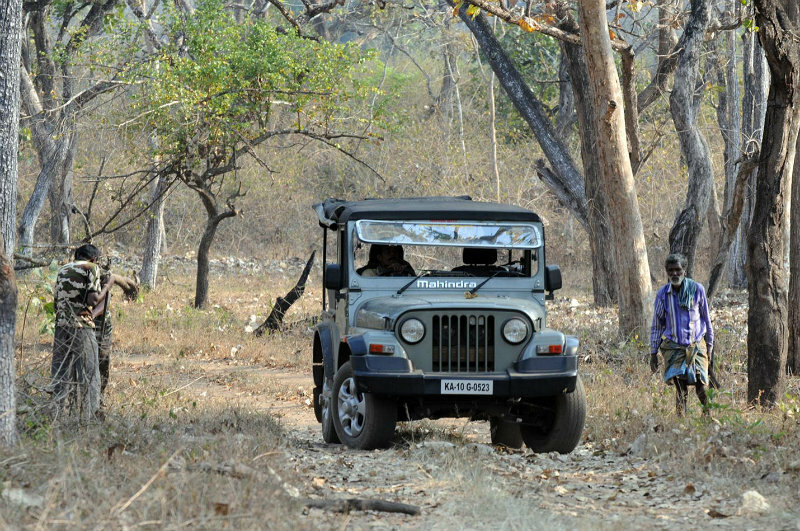 Vehicles have been deployed at Bandipur, Gundre, Maddur and Hediyala ranges that are more prone to fire and can be transported anywhere in case of an emergency. These vehicles have two motors — five HP and three HP – to pump water to smaller cans as per requirement. All vehicles have a 50-metre long pipe attached to it and will facilitate the guards to extend their reach. Motorised water sprayers and other water-spraying equipment are connected to mobile water tankers. Special zones have been formed based on past fire incidences and strategic plans have been prepared to prevent forest fires. 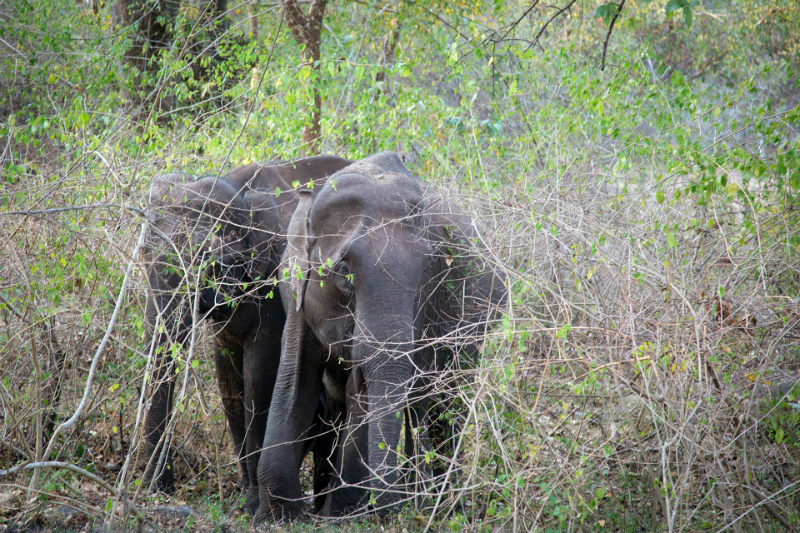 Sensitive zones include Bandipur (due to the presence of tourists, tigers and National Highway 67 that connects Kerala), N. Begur, Gundre, Maddur (due to thick forest) and Himavad Gopalaswamy Betta Range (presence of tourists and devotees). “We had a problem of communication last time as walkie-talkie signals were not reaching the desired instrument holders deep inside the jungles and on the fringes. To prevent this, this time, we have set up two repeater stations at Moolehole and Kundkere ranges for the signals to effectively percolate during crisis situations. We have also procured 75 new walkie-talkies,” he said. 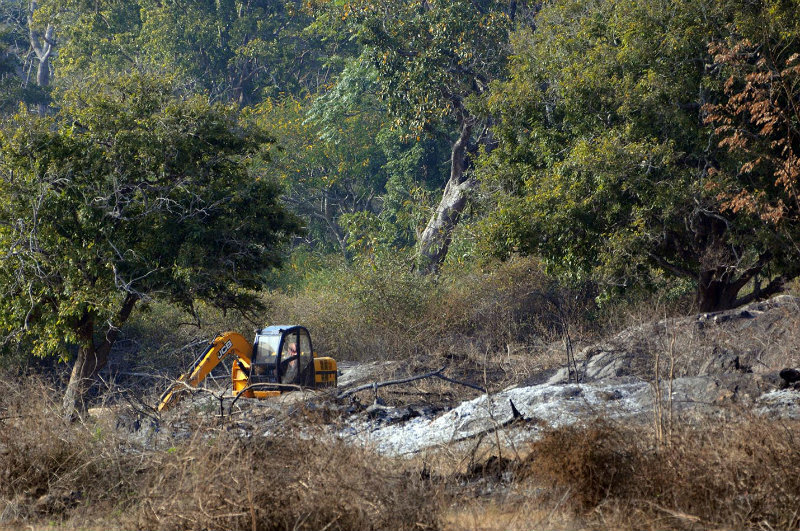 Forest officials are speaking to tribals who live on the fringes of Bandipur National Park. Such moves are aimed at improving relationships so that the tribals will alert the department in case of forest fires. As a preventive measure, the local tribal community too has been taken into confidence to help alert the forest staff and also douse fires. Awareness programmes have been organised at tribal hamlets around the Tiger Reserve to underline the inimical effects of such fires. “The department has formed over 35 teams of ‘Aranya Sene’ to combat forest fires and each team has 10 to 18 tribal volunteers (educated tribal youths) who will spread the message of conservation and fire prevention. Their mobile phone numbers have been procured and each of them has been given T-shirts, caps and badges. We will also pay them whenever their services are availed,” Ambadi Madhav added. A backhoe is being used to create a fire line. The Forest Department will experiment controlling the wild growth of lantana using ‘Lantana Lace Bug’ at Bandipur Tiger Reserve. Lantana has become one of the world’s most invasive weeds, form impenetrable thickets covering large areas of valuable land, and it becomes impossible to control its growth. Scientists at University of Agricultural Sciences in Bengaluru have taken up research to analyse the pros and cons of using the bug to control the wild growth of lantana in the forest area. Apart from lantana causing forest fires to spread rapidly, it obstructs the free movement of animals. Often, wild animals get stuck inside the lantana weed. Though lantana looks attractive with various colours, it is dangerous for the growth of other plants in the forest and also hinders the movement of animals. Moreover, dry lantana catches fire easily and spreads forest fire rapidly. As it is impossible to eradicate lantana using human force, it has become inevitable for the Forest Department to find alternative methods to control the lantana weed. ‘Lantana Lace Bugs’ will feed on the leaves and flowers of the lantana resulting in the death of the plant. But the scientists of University of Agricultural Sciences, Bengaluru, are conducting experiments to check whether the bug will affect the other plants and vegetation in the forest. 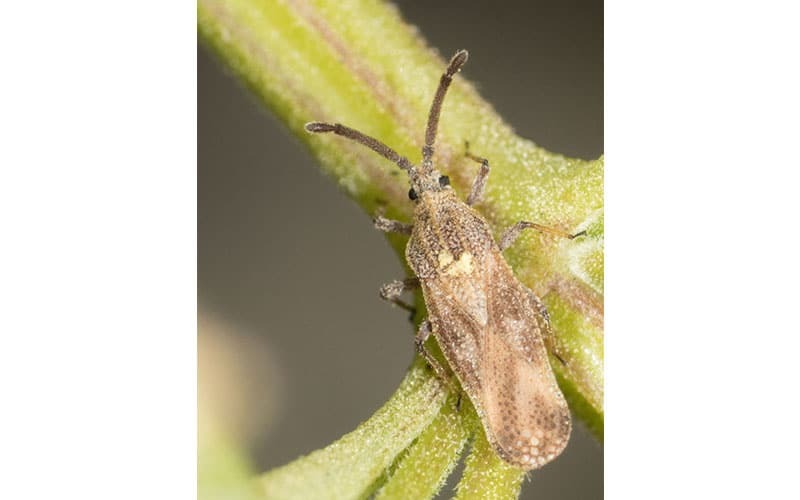 The bugs would be used extensively once the scientists give assurance that it will not affect the other vegetation and methods to be taken in case these bugs become overpopulated and uncontrollable. Lantana lace bug belongs to South Africa and has been experimented by several countries for controlling the weed.